Some of the 21 plaintiffs, along with attorneys and supporters, gather on the steps of the federal courthouse in Eugene, Oregon, after a hearing demanding the U.S. government take science-based action against climate change in March 2016. The day before Donald Trump’s inauguration, a group of environmental lawyers had hoped to depose Rex Tillerson, Trump’s nominee for secretary of State, in Dallas, Texas. Julia Olson wanted to grill the former ExxonMobil CEO and American Petroleum Institute board member about climate change: what his industry knew, when they knew it, and how they lobbied the federal government to address — or ignore — the problem. Industry lawyers disputed the request, and at press time it was unclear if the deposition would actually happen. But if it does, Olson will add Tillerson’s testimony to the evidence she is gathering for a trial in Oregon later this year, where she will try to convince a federal judge that the government’s failure to stem the climate crisis violates the constitutional rights of her clients — 21 young people not yet old enough to legally buy a drink. This lawsuit is as broad as most are narrow. Environmental litigation is often incremental, ensuring that the government dots its i’s and crosses its t’s when permitting energy projects or carving out endangered species habitat. Olson’s case is instead designed to upend our entire fossil fuel-based energy system. Olson argues that embedded in our rights to life and liberty is the right to a habitable planet — a right imperiled by rising seas and extreme weather. The federal government, she says, has willfully violated that right by unearthing and burning fossil fuels while fully aware of the consequences. And she’s representing youth because today’s 10-year-olds will be more profoundly impacted by climatic chaos than, say, our 70-year-old president. The case is grounded in the “public trust” doctrine, which states that the government is obliged to manage certain natural resources for the long-term public good. The idea dates to Roman times and in the U.S. has been mostly applied to waterways. In a landmark 1892 case, the U.S. Supreme Court found that Illinois could not sell a lengthy stretch of Lake Michigan’s shoreline to a railroad company because the state held the lake’s waters in trust for the people. The court saw the lake and its shoreline primarily as a corridor of commerce. But the idea of the public trust expanded over time. In 1983, the California Supreme Court stopped Los Angeles from emptying Mono Lake because it would hurt wildlife and diminish the lake’s recreational and aesthetic values — also part of the trust. Olson hopes to establish that the government has an intrinsic responsibility to protect the atmosphere, too. The court will wrestle with questions like: What is a habitable climate system? And at what point is it endangered? “You can’t have that conversation in Congress,” Olson says. “This will be a legitimate review of why we are in this mess.” The trial will cover government leasing programs and tax policies that support fossil fuels, and political decisions to leave meaningful remedies for a warming world for another day. Ultimately, the plaintiffs want federal policies to reduce carbon emissions enough to prevent catastrophic warming. Judges wouldn’t write those policies, but the lawyers want to ensure that they reflect sound science. And they want courts to supervise their implementation, much the way courts oversaw school integration after Brown v. Board of Education. “We’re looking for swift, game-changing action as soon as we can,” Olson says. “For years, lawyers (tried) to establish a constitutional right to a clean environment, with no success at all,” says Michael Gerrard, an environmental law professor at Columbia University. Then, in 2013, Pennsylvania courts struck down a law that blocked local governments from restricting oil and gas drilling, saying it violated the state’s constitutional obligation to conserve clean air, water and scenery for future generations. 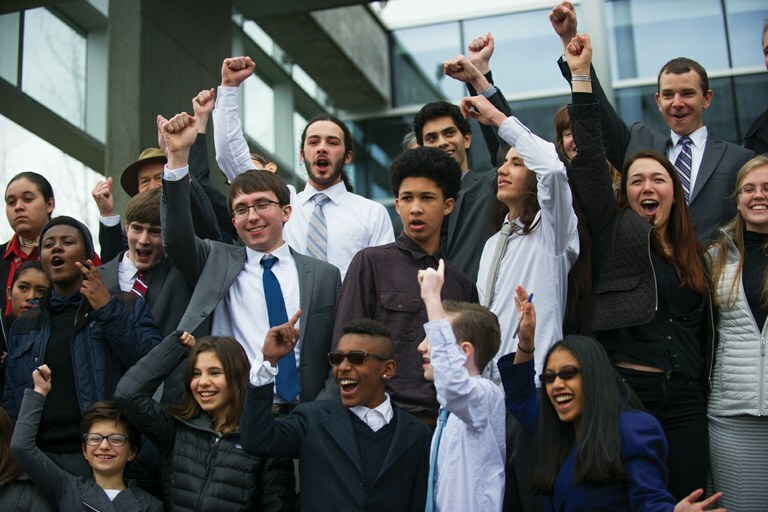 Olson and her allies also notched some victories: This year, Washington and Massachusetts courts ruled in favor of youth plaintiffs in state-level versions of Olson’s federal suit. Those cases, supported along with the Oregon suit by the nonprofit Our Children’s Trust, forced state agencies to develop emission-reduction plans. There was another major breakthrough this November, when a federal judge in Oregon shot down the government’s and industry’s motions to dismiss, allowing Olson’s case to go to trial. “The trial court’s decision was quite remarkable and unexpected,” Gerrard says. For the first time, a federal judge implied that the Constitution did entitle Americans to a livable environment, and that the question of whether that right was imperiled deserved a hearing. “I have no doubt that the right to a climate system capable of sustaining human life is fundamental to a free and ordered society,” Judge Ann -Aiken wrote. Now Olson must convince the court of the direct connections between federal energy policies and the harms wrought by climate change, and of its authority to make the government change its ways. If she wins, the question becomes whether the case can survive on appeal, even up to the nation’s highest court — which could soon welcome a new justice, maybe two, appointed by Trump.